the first black king in the Kingdom of Boxing. and so he wandered off to a distant land. Voice is an elusive, undefinable entity, but when you happen upon a story with great voice you immediately know it. It grabs hold of your emotions and won’t let you put the book down. Identifying exactly what makes for great voice can be tricky. So instead, I’d like to share a few observations about this wonderful, engaging text. First off, the line breaks provided powerful pacing and a sense of urgency. The occasional all-capped words helped emphasize certain words, which gave the text a unique rhythm and flow. Strong verb choices punched up the story tension, especially the fights scenes such as this spread where Muhammad won an Olympic gold medal, “Then he TALKED and JIVED and PRACTICED and PUNCHED his way to victory…” Wonderful alliteration and clever descriptive phrases added to the great overall “feel” of the story. Also, the author seamlessly wove actual quotes from Muhammad Ali into the text which were very moving. Hearing the main character’s own words in a story can have great impact on the reader, and the quote choices and placements in this text were extremely successful. Obviously, Jonah did a boatload of research for this title, which resulted in incredible quotes and many fascinating details that added to the book’s authentic, compelling voice. It was a thrill to discover this inspiring pb biography (although belatedly), and I enjoyed learning many new things about “Float like a butterfly, sting like a bee” Muhammad Ali. 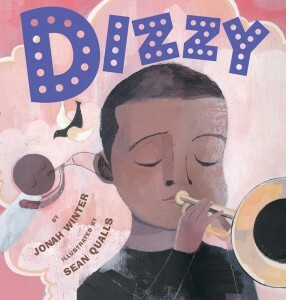 If you’d like to read more of Jonah Winter’s great pb biographies, here are a few of his other titles — Barack, Sonia Sotomayor, Roberto Clemente, Dizzy, Lillian’s Right to Vote, and more! Book Giveaway – I will select one winner to receive a copy of Muhammad Ali, Champion of the World from those who comment on this post by Feb. 21. I’d love to hear about your favorite pb bios! 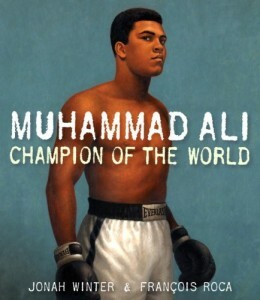 biography, Francois Roca, Jonah Winter, Muhammad Ali Champion of the World, nonfiction, Schwartz & Wade, voice. Bookmark. One of my favorite’s is THE RIGHT WORD…it’s about Roget and how he created the thesaurus. It’s beautifully written with stunning illustrations! One of my favs too! I agree, the illustration are outstanding. Oh, so many favorites! Suzanne, I love THE INVENTOR’S SECRET! And I love GINGERBREAD FOR LIBERTY, NOAH WEBSTER AND HIS WORDS, THOSE REBELS, JOHN & TOM. And I’m with Kristi – THE RIGHT WORD is fantastic. YOU CAN’T DO THAT, AMELIA is another favorite. I could go on and on! 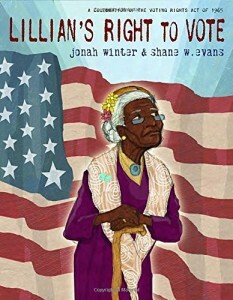 I loved Jonah Winter’s LILLIAN’S RIGHT TO VOTE. I can’t wait to read this one on Mohammed Ali. Thanks for a great post! Wow, you have quite a list. Sounds like you enjoy historical titles. Thanks for sharing! Hello–I have so many favorite PB bios, but an oldie but a goodie is certainly SNOWFLAKE BENTLEY. Newer favorites include A RIVER OF WORDS about William Carlos Williams by Jen Bryant. I, too, love writing bios. Such interesting lives of real people are so inspiring! Oh Ann, I love Snowflake Bentley! Such a great one. I’m a big fan of Jonah Winter’s work. One of his early pb bios on Frida Kahlo is lovely and so lyrical. And Lilian’s Right to Vote is so powerful and moving. Thanks for sharing this new bio with us! You sure know your pb bios Maria! You named one I haven’t read, so it’s off to the library for me! Thanks for sharing. Our favorite, by far, is the Noisy Paint Box. Thanks for these new ideas! Ah, another good one. Thanks for stopping by Tracy! I loved Enormous Smallness by Matthew Burgess and Kris Di Giacomo. 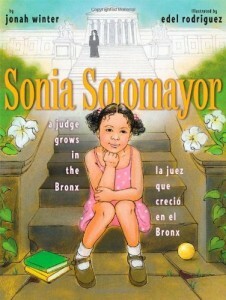 and am currently reading Different Like Coco by Elizabeth Matthews and Bon Appetite! The Delicious Life of Julia Child by Jessie Hartland. Great fun, all. I agree, such great fun! Thanks for sharing! Oh thanks for sharing! I love pb biographies. Abe Lincoln crosses a creek is a personal favorite. I’ll have to pick up a few of these as well! Now I have to pick up Abe Lincoln Cross a Creek! So many great books to discover! I am currently working on a picture book biography and love reading them. One of my recent favorites was Diego Rivera: His World and Ours. Yes, Diego Rivera is a good one! Can’t wait to see you pb bio. Kristi! HARD to pick an all-time favorite, but I’m going with Dave The Potter. 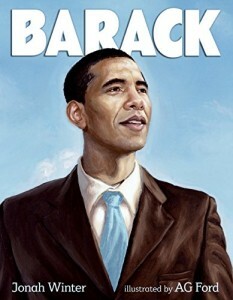 Maybe it’s because I met the illustrator (Bryan Collier) but I have special love for that one. Lucky you meeting Bryan Collier! Thanks for stopping by! Thank you for sharing this, Suzanne. One picture book biography that I love is STAR STUFF: Carl Sagan and the Mysteries of the Cosmos by Stephanie Roth Sisson. I was completely drawn in by the simple but lyrical text and the beautiful illustrations. I love ODD BOY OUT, a picture book about young Einstein. 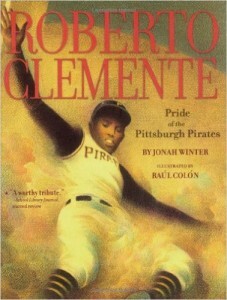 Years ago I taught a genius [a second grader] and introduced him to this book. Agree, that’s a great one! And I also love science, so that makes it even better! Thanks for stopping by! I’m a big fan of Jonah Winters (and his always-distinctive voice) too. Love his You Never Heard of Willy Mays (and Sandy Koufax)?! books. As for other bios, Me . . . Jane is one of my all-time favorites. All great books! Thanks Linda! I LOVE PB Bios, too! Trying to write a few, actually. I am a big fan of Andrea Davis Pinkney, ever since hearing her speak at PB Summit. Talk about VOICE! This is becoming a really great list of PB Bios, I’m gonna check them all out! How fun to hear Andrea Davis Pinkney! I’m jealous! Thanks for sharing. My absolute favorite picture book biography has to be EMMANUEL’S DREAM By Laurie Ann Thompson. It is a must read. Thanks for sharing your recommendation – logging onto my library site now! I can’t wait to hear the ‘voice’ Thanks for sharing. I hope you like it as much as I do. Thanks for stopping by! I have always been fascinated by Ali. Did you know his daughter, Laila, became a professional boxer as well? Very interesting! I did not know that about his daughter, but now I want to find out more. Thanks for sharing! and “Thank you, Sarah–The Woman Who Saved Thanksgiving” by Laurie Halse Anderson and illustrated by Matt Faulkner. Such a great list. Thanks for sharing! Your art teacher is lucky to have you! Thanks for stopping by! I just got a ton of book ideas for the next trip to the library! Thanks, everyone! Me too! What a great collaborative list of wonderful books! I recently read Lillian’s Right to Vote. I loved how the author showed Lillian’s road traveled in order to arrive at a voting box.